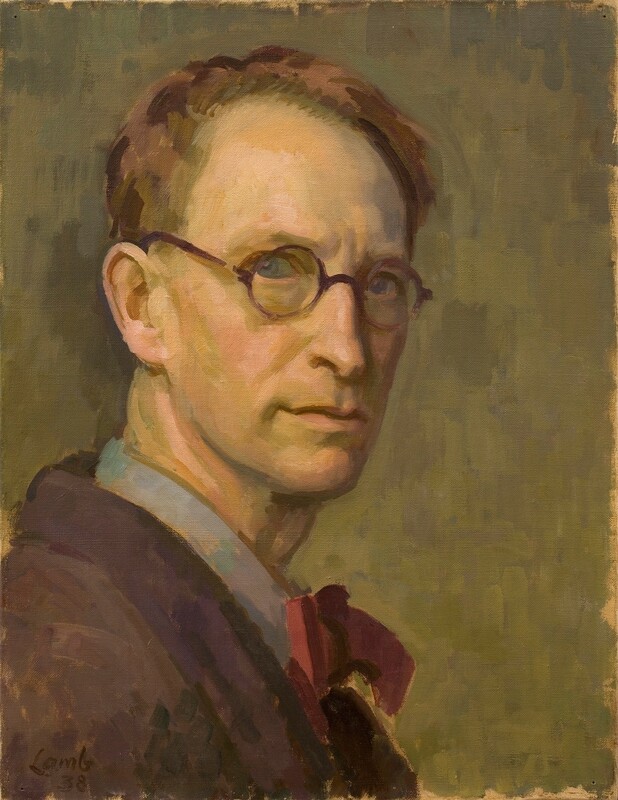 Henry Lamb was born in 1883 in Adelaide, Australia, one of seven children to Professor Horace Lamb and his wife, Mary. Shortly after his birth, his father took up a post at the University of Manchester, and Henry Lamb was raised in Manchester. He initially trained as a doctor in Manchester and then Guy’s Hospital, London, abandoning this path in 1905, but returning to medicine upon the outbreak of WWI. Lamb served as a surgeon in Macedonia and Palestine during the war, and was appointed an Official War Artist upon the conclusion of the hostilities. A commission for a large-scale war work as part of a project involving many artists resulted in his monumental Irish Troops in the Judean Hills Surprised by a Turkish Bombardment (Palestine War Picture), 1919, Imperial War Museum, a complementary work to Stanley Spencer’s Travoys Arriving with Wounded Soldiers, 1919, Imperial War Museum. Lamb had his first solo show at the Alpine Club Gallery in London in 1922, followed by a series of solo and group exhibitions at the prestigious Leicester Galleries for the rest of his working career, including a memorial exhibition in 1961 after his death. In 1940 Lamb was again appointed an Official War Artist until the end of WWII in 1945, with the majority of his output consisting of portraits of servicemen, primarily officers but also some rank and file soldiers. In 1942 he was appointed a Trustee of National Portrait Gallery, and a Trustee of the Tate in 1944. In 1949 he was elected to the Royal Academy. By the end of the 1950s he was suffering from severe arthritis, which impeded his painting, and he died in 1960. His work is held in major international public collections including the Tate, the Imperial War Museum and the National Gallery of Canada. There are just four known painted self-portraits by Lamb: a very early pre-art school Self-Portrait with Hat from 1904 in the style of William Orpen; two in the National Portrait Gallery book-ending his career in 1914, very much in the London Group style, and in 1950; and the self-portrait in question from 1938. In 1938, Lamb was living in Salisbury with his second wife, Lady Pansy Packenham and their three children. On the eve of WWII he was on the verge of a phase in his career of serious recognition, receiving various accolades and elections to notable positions. His close friend Anthony Powell recollected that he was, “Regarded in his early days as devastatingly handsome, he was thin, unrelaxed in manner, with a searching air…In all branches of the arts he held opinions very much his own, and was well read in out of the way books. Witty, unpredictable, fractious, he wrote vigorously articulate letters, especially to people who rubbed him up the wrong way.” A complex person, he was an intellectual, well-read, musically talented almost becoming a concert-pianist, but prone to bouts of depression, and belligerence, which led to the premature ending of many friendships. Lytton Strachey described him as, “Like some desperate, proud, fallen angel, plunging into darkness…he nourishes himself up in his torments as if he loved them”. In this self-portrait, Lamb looks handsome still, a striking, powerful presence, directly addressing the viewer. Roguish, with the ruffled air of a bespectacled intellectual, there is nonetheless the suggestion of vulnerability, even sadness with his slightly furrowed brow, unsmiling lips and quiet gaze. He is only half-inclined towards the viewer, his shoulders having not yet followed the turn of his head, so that we see him in three-quarter profile. In the 1930s, Lamb underwent a quite dramatic change in his style from the stylisation of the Strachey portrait, with its emphasis on the Slade School inspired line, to a freer, more spontaneous handling of paint. Lamb’s confidence in his new-found style is evident in the self-portrait. The background of a moss-green wall is painted quickly with broad vertical brushstrokes, whilst Lamb’s jacket is similarly depicted with loose purple dabs of paint hastily applied. Lamb’s energetic handling injects his self-portrait with vibrancy and movement and gives the impression that he has captured himself in the action of spinning around to face the viewer. His face is likewise made up from expressively applied touches of pink, green, purple, and yellow but exquisite details of light and shading forcefully animate his head so it seems to spring forward from the comparative looseness of the painting. His blue eyes seem watery with pink rims, plausibly strained from reading, painting and even age. Touches of green around his mouth, under his eyes, and in the creases of his cheek suggest signs of ageing and the limitations of human flesh. Round spectacles perched on the bridge of his nose are outlined with a few dry strokes of purple paint – the careworn intellectual. Light falls from the left, and Lamb picks out highlights on his distinguished high forehead, with gently receding hairline, on his right cheek, the lobe of his right ear, the tip of his nose, and the folds of his neck as he turns to look at us. The strain of the position exaggerates his Adam’s apple, whilst the left side of his face falls into shadow. Alongside the beautiful spontaneity and texture of his brushstrokes and the self-revelation, Lamb’s use of colour in this painting is extraordinary. His teacher and friend Augustus John wrote that, “He seeks with an almost mathematical ingenuity to invent new harmonies of colour in combination with a most searching analysis of character…[a] passionately serious painter, for whom any intellectual concession”. The complementary colours of dark green, in the wall and the skin tone, and magenta purple, of jacket, hair, spectacles and shadows on the face, appear across the composition, uniting in an exquisite harmony. At once lifelike with the forceful presence of Lamb emanating from the canvas and yet self-consciously painterly in colour and style, it is a self-portrait that draws attention to its very nature – a painting by a painter. A supremely beautiful and powerful painting, and one of just two self-portraits in private collections, it captures Lamb in all his fascinating complexity. “He is no ordinary personage”, wrote Augustus John to Ottoline Morrell in 1908, “He has the divine mark on his brow”.